Today in our 31 Days of Preparation series we're going to talk about preparing an emergency bag that can be kept in the car or at home. This isn't the Emergency Preparedness 72 Hour Grab-and-Go Bag that we'll be discussing later in the month...that's a disaster supply kit of basic items that your household may need in the event of an emergency/evacuation (tornado, hurricane, national disaster). Today's post is about preparing for those unexpected moments when you find yourself needing to be away from home for a few days. There are those times when the unplanned can happen. Maybe an out of town family member or friend is sick and needs someone asap. Perhaps something happens with our health and we find ourselves in the unexpected situation of being admitted to the hospital. It could be that dear ones in our lives have an emergency and they need us to stay with their family. Our goal during these times is just to get to those who need us instead of thinking about quickly packing a bag with all the essentials for a stay away from home. When my Grandmother and Mother were both unexpectedly admitted into the hospital, I found myself away from home for several days at the time and needing essential supplies. When we got the call that Grandmother had a stroke, we left immediately and didn't pack a bag or do anything except focus on getting to her. One day I took Mom to the doctor for a check-up, only for her doctor immediately admit her into the hospital...a stay which ended up lasting over a month. 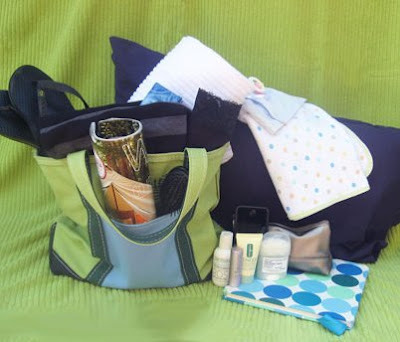 Packing a Grab-and-Go bag and having it in the car not only could have made things easier, but it would have allowed me to stay by the side of my loved ones, instead of needing to leave to pick up essentials. So, you're convinced a Grab-and-Go bag is a good thing...now, what to pack? Think about what might be needed on an overnight stay. I know the first thing we usually think of is a change of clothes, jammies, slippers and toiletries, but what if getting food is a challenge? While staying with Mom and Grandmother in the hospital, the food machines weren't always filled and the cafeteria and gift shops were only open during certain hours which were usually the same hours when the doctors might stop by with updates. I learned quickly to pack food! Buying from machines and going through the drive-thru can really add up, so having snacks on hand can save quite a bit. Food is not the focus when we're caring for loved ones, but it's important to make sure we have nourishment so we can continue offering that care. Sometimes an overnight stay might mean we aren't sleeping in the most ideal of locations. Think about packing a small pillow and light blanket to ensure a comfortable night's sleep. A fleece throw or a soft chenille type blanket is thin enough for packing, yet can offer warmth in a cold room or snuggles for a quick nap. If there isn't enough room for a traditional small pillow, consider an inflatable one wrapped in a pillowcase. They save space, but can still offer a soft place for your head for fall. Inflatable pillows can be found in most bath and body sections...you know, the kind used for a lavish soak in the tub. These are perfect because they're usually covered in a soft, terry cloth fabric for added comfort. Keeping busy is essential. Take things to keep your mind moving forward in a proactive way. Include reading materials like a Bible, devotionals, favorite novel or magazines for those quiet moments. Make sure to have a pen and paper to jot down notes or thoughts during your stay. A little notebook or journal is perfect to keep notes on updates, schedules, to-do lists, medicine changes, passcodes (if you're staying at some else's home) or directions. If you're packing for little ones, don't forget to include a favorite cuddly toy, story books, crayons and activities to keep them entertained. In your toiletry kit, make sure things are sample or travel sized and pull double duty. Apple cider vinegar is great as a facial toner, but also works as a conditioner and foot soak. Peroxide makes a great mouth wash and can sanitize cuts and scrapes. Make sure to pack comfortable clothing. The amount of changes will be up to you, but we like at least two or three changes of clothes. If they all coordinate, it'll give quite a few days worth of options. If you don't want to remove the clothes from your regular wardrobe, purchasing a few pieces can be done quite economically. Think out of the box and stop by local consignment shops, Goodwill, Salvation Army or yard sales. Since kids' clothing changes as they grow, yard sales are a wonderful way to have those extra emergency pieces on hand without much of an investment. When thinking of jammies, don't forget that others might be able to see you (the hospital) so consider modest choices like t-shirts and cotton pants (; Slippers were essential for me while staying in hospital!! Having your shoes off really increases the comfort factor and slippers or flip-flops allow you to walk about without needing your shoes. Having some extra cash stored in your bag can also be a good thing. It can help with parking, tolls for travel, extra funds for gas, food, etc. Putting a few dollars aside here and there can be a blessing should that Grab-and-Go bag ever be needed. Putting together a simple Grab-and-Go Bag doesn't have to break the bank and can be done over time if you like. Make a list of things to be included and each time you go to the store, pick up a couple of the items on the list. Once purchased, simply add it to your bag. You'll find that Grab-and-Go bag will come together in no time! If you're packing for little ones too, let them be involved in the process. Get their feedback on what they'd like included and let them pack their own bag. Money - Extra monies for parking, tolls for travel, extra funds for gas, food, etc. Have you put together a Grab-and-Go bag? What items do you include for those unexpected emergencies? I hope you'll join us for our 31 Days of Preparation journey. Tomorrow we'll share 10 Simple Ways to Prepare for Guests and how to make them feel at home. Just in time for the holidays! Enter your email below and each post will automatically be delivered to your inbox. Don't forget to stop by the many other 31 Dayers for additional inspiration!